The universe is everything. It is so vast that the moment you start thinking or study about it, the more you get to know that one lifetime is not enough to cover all of it. If you’re fond of the wonders of space or a fan of star trek, you probably know that what we call in the old days as heavenly bodies are not just composed of planets, suns, comets, and rocks– the universe offers a lot more interesting things. Serious science is dedicated in order to crack the secrets of the universe one bit at a time. As science unravels the marvels of the universe, we humans get to see pictures of its awesomeness. The more we know about the beauty of deep space, the more we think, dream, and inspire about it. Some space inspired masterpieces are found not just in canvass or film, but also on skins. Space inspired tattoos are massive in terms of variety and following. Getting popular nowadays on these subjects are the full sleeve types. It is expected though, since space is big, it also needs to cover big spaces of skin. 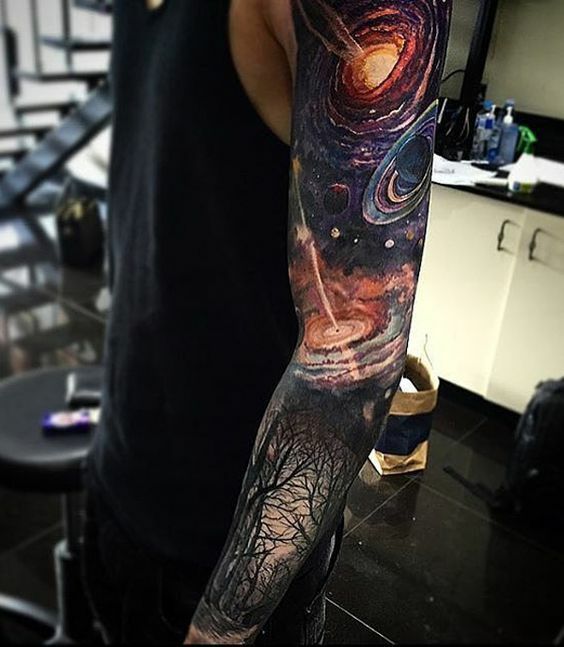 Especially done in full colors, intergalactic full sleeve tattoos takes you to the farthest regions of the universe where no man has gone before. Here are the 30 Intergalactic Full Sleeve Tattoo Designs for everyone!